Solomon, Solon. “From the Barrier to Refugee Law: National Security’s Transformation from a Balancing Right to a Background Element in the Realms of Israeli Constitutionalism.” International Journal of Human Rights 19.4 (2015): 447-64. Mapping cardinal cases of the Israeli Supreme Court, the article will demonstrate how, in the Israeli constitutional experience, the concept of national security came to be transformed from a balancing right to a background element. Along these lines, the article will argue that while Israeli constitutionalism indeed awarded national security parameters a decisive role in the realms of the human rights balance judicial discourse, it equally embarked on a procedure of delineating the existence of national security as an autonomous consideration, in cases where national security exigencies ceased to be obvious in the Israeli reality. Compelling the examination of a national security debate under the human rights lens, the Israeli Supreme Court aligned its jurisprudence with that of other supreme courts as well as with the international thematic constitutionalism model, aspiring to interpret the different fields of laws and various provisions under the concept of the right to dignity. Craig, Alan. International Legitimacy and the Politics of Security. 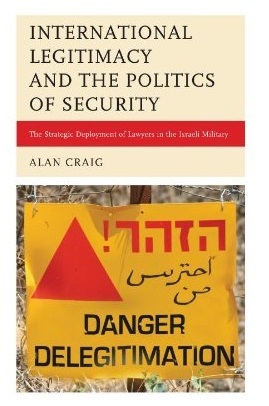 The Strategic Deployment of Lawyers in the Israeli Military. Lanham, MD: Lexington, 2013. Bendor, Ariel. “Review.” Israel Studies Review 29.2 (2014): 155-157. Belge, Ceren. “Review.” International Journal of Middle East Studies 47.1 (2015): 179-180.